Channel 2 Action News has learned the press secretary for former Atlanta Mayor Kasim Reed has been served two criminal citations. It is the first ever criminal charge under the Georgia's Open Records Act. Channel 2's Richard Belcher has been following this case for more than a year. It began in 2017 when Channel 2 Action News asked for public records involving unpaid water bills by government officials, but didn't receive the records for weeks. 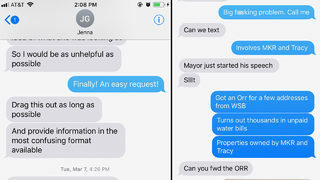 Another city official, Lillian Govus, later provided a Channel 2 Action News producer with text messages showing that Garland ordered Govus to delay the release of the records. The Georgia Open Records Act says public agencies shall notify persons requesting records within three days when the records will be available and provide the records in a reasonable time frame. In the charging documents against Garland, both citations clearly reference Channel 2 Action News' role in seeking public records, which authorities contend Garland illegally defied. Both citations are misdemeanors. "Ignoring the state's Sunshine Laws will come with a heavy price," said Richard T. Griffiths, the president of the Georgia First Amendment Foundation. He says these charges send a clear message. "Just because you're a public official, doesn't mean to say that you can ignore the public's right to know what's in the documents," Griffiths said. Professor Greg Lisby of Georgia State University says Reed regularly showed a blatant disregard for the public's interest and he believes Garland took her cues from office culture. "I cannot imagine that she did this on her own without somebody somewhere at least leaning in a certain direction that lead her to the conclusion that she could do this and get away with it," Lisby said. Late Monday, Belcher received the following statement from Garland's attorney. A spokesperson for the city said, "The Bottoms administration is committed to restoring public trust between Atlanta residents and the government."